narrowboat_Abigail_Jenna: Rubber Duck or Hatted Duck? During the last week I have slowly pontoon hopped all the way up to Washingborough on my way to pick up derv at Saxilby. As I moved along the boats that had been to the rally in Sleaford passed me on their way home. On more than one occasion I would have used the radio ‘Rubber Duck we have a convoy’!! but I did manage to contain myself. Each pontoon gave the opportunity to wander off on the bike visiting the local area. Plenty of interesting items and will have to do a second visit to do a proper job of it. 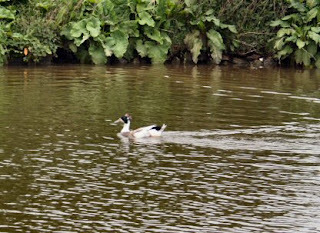 I spotted the hatted duck on the travels and managed a photo of it. A closer look makes me think that although there is definitely a tuft on its head the bird itself must be a cross of some kind. 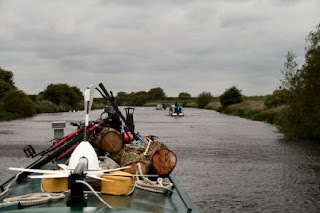 As I went through Bardney Lock I met a boater who said that his friend Peta Hill had said to keep an eye out for me – the bike with a green narrowboat attached to it. Oddly enough it was only yesterday that I saw Peta for the first time in ages when I visited Trinity Church in Louth. 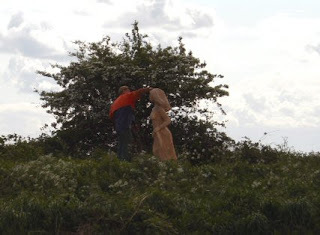 As I neared Washingborough I saw that one of the sculptures was still in the process of being made. What I thought last time was a fairly plain outline of a woman is now looking really good and I must get the bike out and have a closer look some time.